Quick and easy ways to create a new look for your pool. One of the new trends in pool decking is to take an old, cracked concrete pool deck and make it look new again by overlaying new decking materials. We are currently working on our fifth pool deck conversion of the year, and counting. Many homeowners are opting to replace existing pool decks with more natural products - brick pavers, blue stone, architectural slabs and travertine - that blend in with their overall landscaping and add a little bit of color to their pool deck. material with sand or use mortar to hold the product in place. 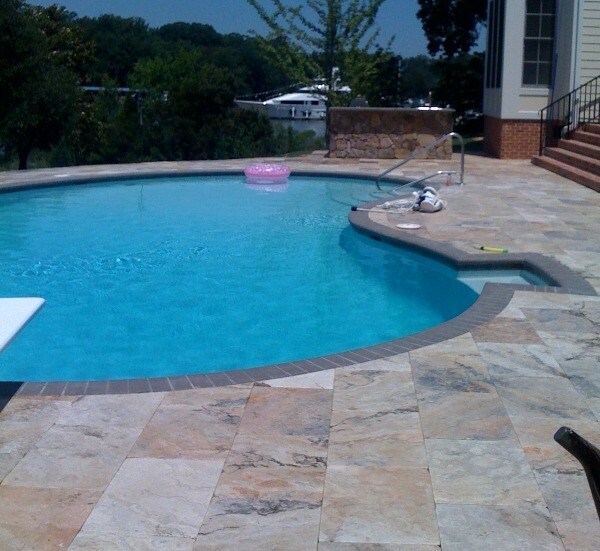 Any type pool - liner, fiberglass or concrete pools - are candidates for this conversion. In many cases we can still use the existing pool coping. Plus it is a quick process; it only takes a week to 10 days to overlay a deck (depending on size). So if you are looking for a way spruce up your pool this summer, try overlaying the existing pool deck to create a whole new look for you backyard.